The Dinsey movie Frozen is one that kids love right now. If you’re looking for easy DIY Halloween costumes this year, I have a tutorial that can make this idea come together in a flash for you. It is so fun to make your own, but it defeats the purpose if you over-spend. 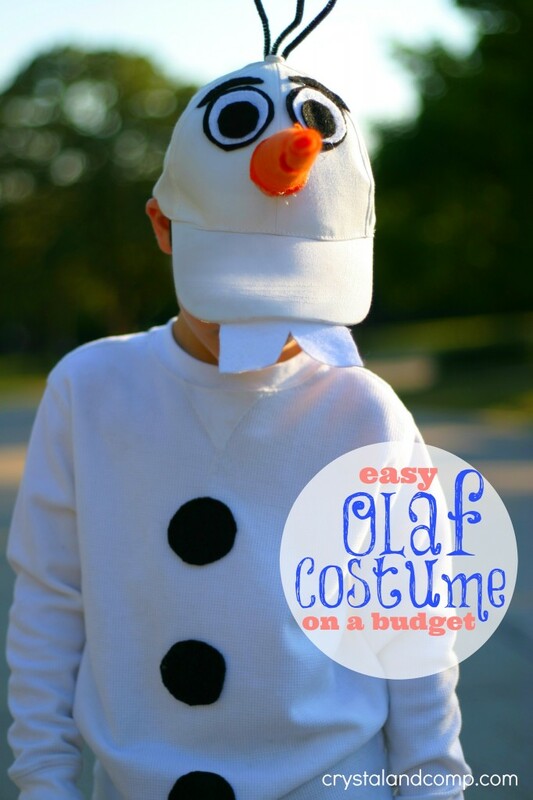 Let me show you how to make an Olaf costume on a budget. This tutorial will cost about $10! This is a great dress up costume for any time of year, once Halloween is over. My kids love to use their imagination and do dramatic play all year long! Check your local craft store for these supplies. The hat and felt will be much cheaper there than ordering it online. This time of year you can usually find felt on sale for 5 sheets for $1. The hat is the main part of the costume and it is super easy to assemble. For the eyes, cut out two, 2 inch, circles from the black felt. Then, cut out two, 1 and 3/4 inch, circles from the white felt. Finally, cut out two, 1 1/2 inch, circles from the black felt. Using hot glue, glue the larger black circles onto the hat for the eyes. On top of that, glue the white circles and then on top of the white circles glue the smaller black circles. Using the black felt, cut out two thick, arched eyebrows. Glue the eyebrows above the eyes. Take some orange felt and cut out a large triangle. The larger the triangle the larger the Olaf nose will be. Roll the felt to make a cone. Seal the edge with hot glue. Stuff the inside of the cone with Poli-Fil. 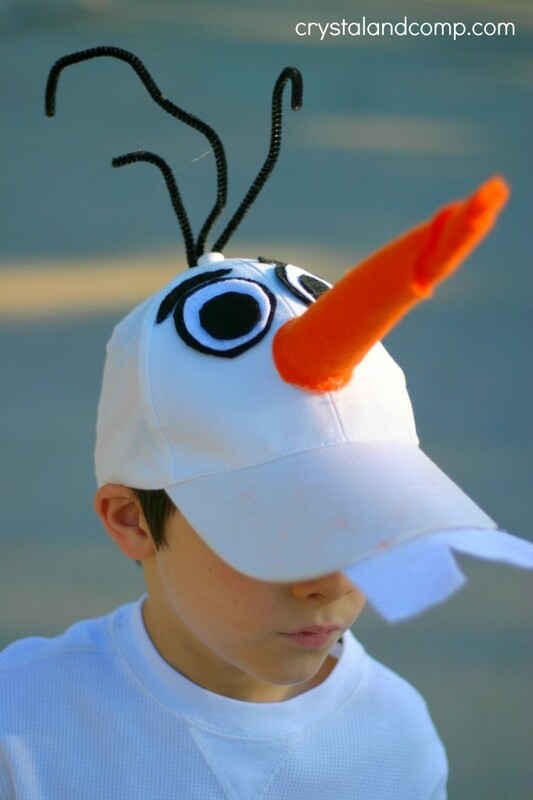 Use hot glue to attach it to the hat. Finally, take three stems of black or brown pipe cleaners. Cut a small slit in the top of the hat. Feed the pipe cleaners up through the slit. Hot glue the ends to the inside of the hat. 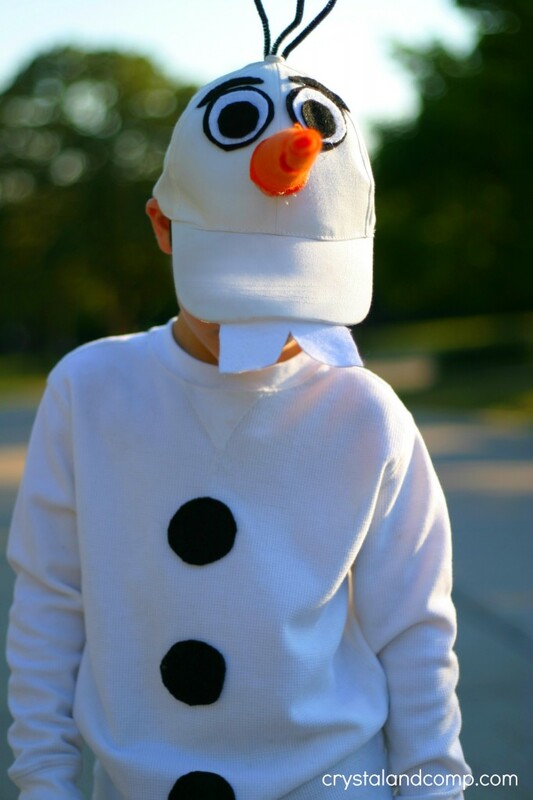 Shape the three pipe cleaners to look like sprigs of Olaf hair that are coming out the top of the hat. I left the middle pipe cleaner longer in length and cut the two end pipe cleaners to be a bit shorter. Finally, cut a 3 and 1/2 inch piece of white felt into a rectangle for the teeth. Cut a vertical slit in the middle of the rectangle so the felt will resemble teeth. Hot glue this to the brim of the hat. Cut out three more 2 inch circles from the black felt. Hot glue them to the white shirt as shown below. 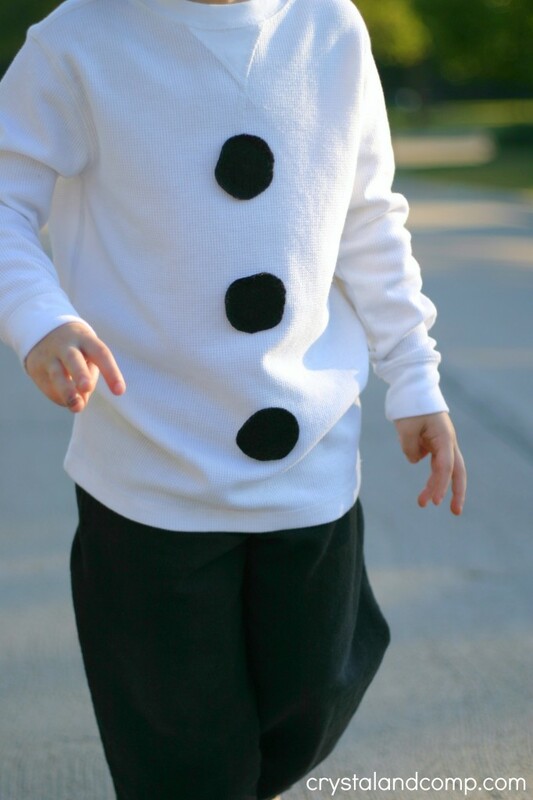 Pair this with some black sweatpants or jeans and you have a DIY Olaf costume on a budget! My little Matthew had so much fun with this costume earlier this week when we were invited to Good Morning Texas to share easy DIY Halloween costumes on a budget in a fun segment. 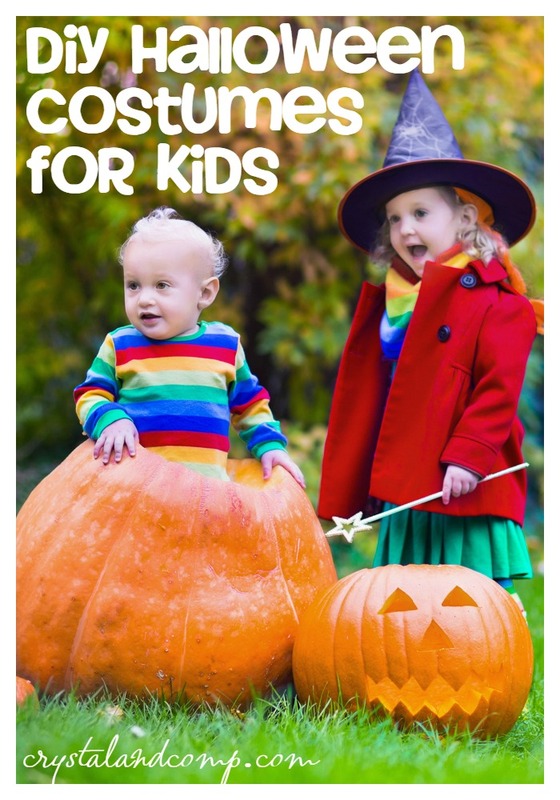 This is such an affordable way to create a trendy costume that all of the kids will love. And remember, this is something they can dress up in all year long as they pretend play and use their imagination! This is super simple and literally takes about 15-20 minutes to makes! 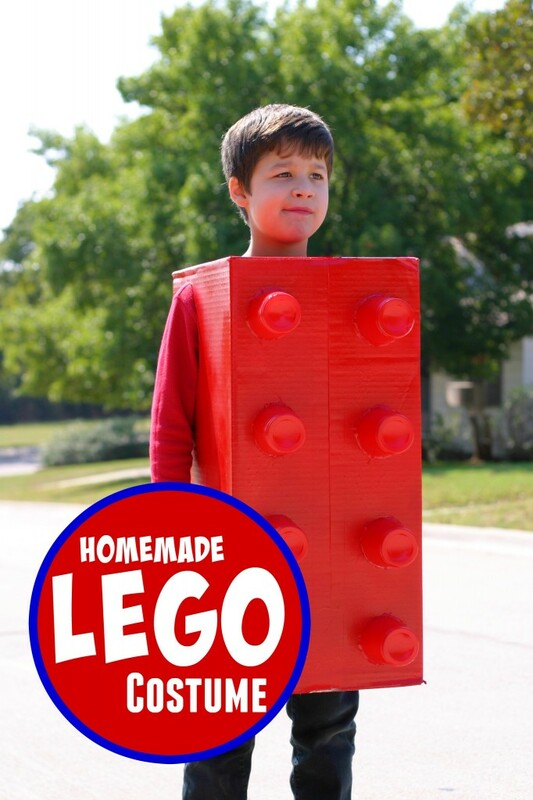 Make sure you check out my Homemade Lego Costume that you can make for next to nothing. All you need is a big box. 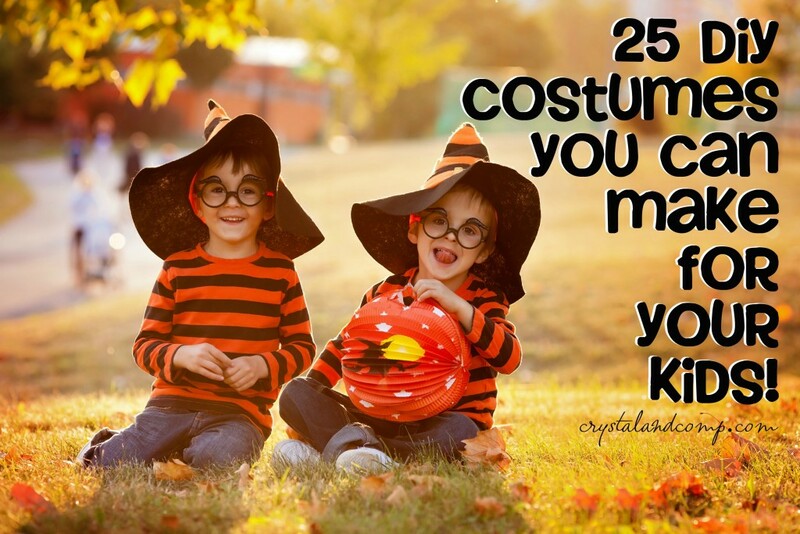 Are you making homemade Halloween costumes this year? I would love to know what you’re creating! Oh, and check out our fun segment on the local morning show. 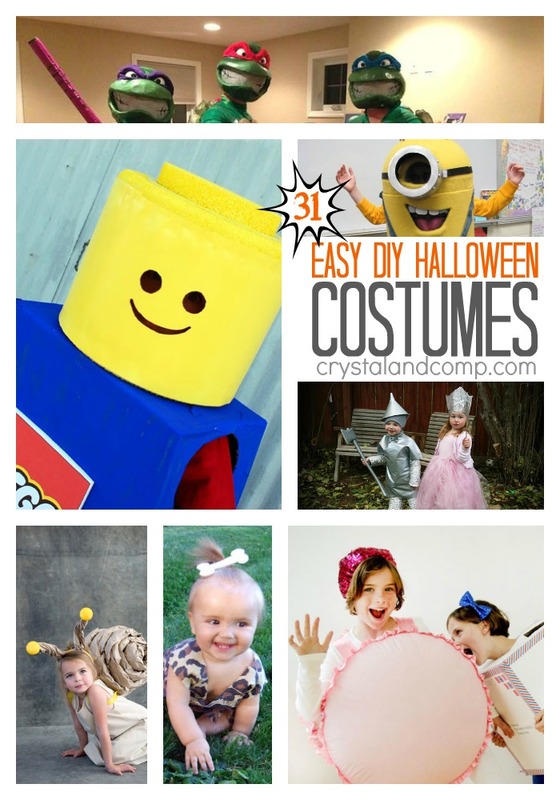 We shared 8 easy costumes you can make for no more than $20 each (some for free)! I am going to show you how to make this super simple, no sew, DIY Ninja Turtle Costume in less than half an hour. Who knew that you can take an aluminum roasting pan and turn it into a turtle costume?! Let me show you how quickly this comes together. I am serious when I tell you that you can create anything with felt and a hot glue gun! 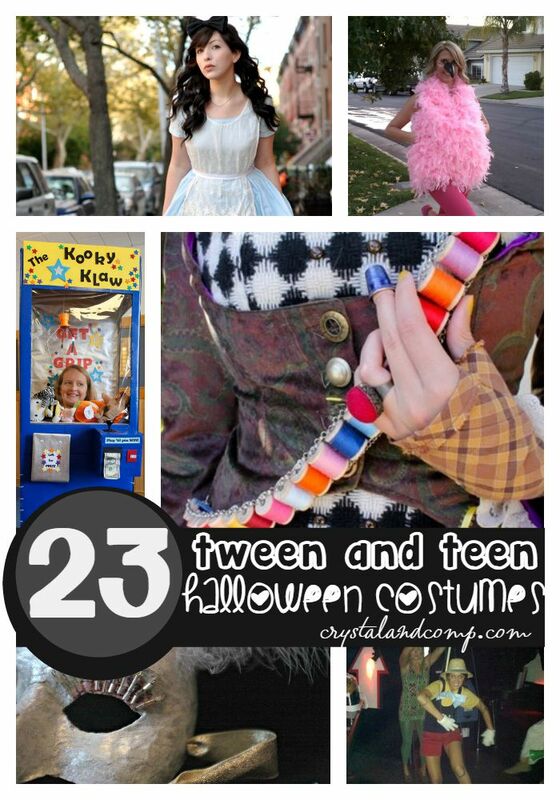 While you’re here make sure you check out my 31 days of easy DIY Halloween costumes from other bloggers all over the internet. 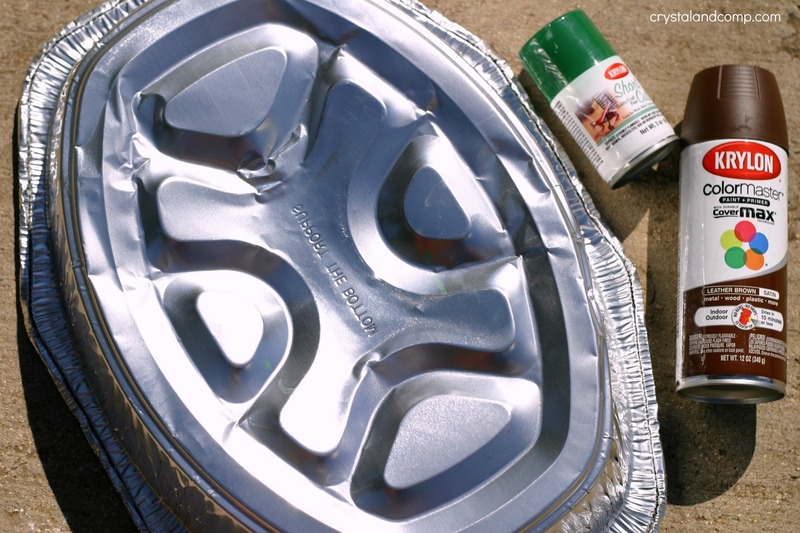 Take green and brown spray paint and paint the outside of the roasting pan. Interchange the colors to make it look camo-like if you want. That is what we did. 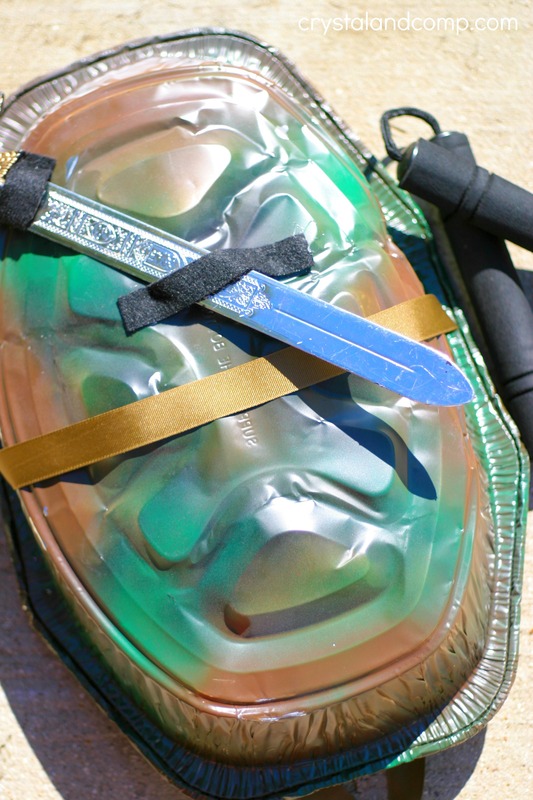 Once it is dry, use a couple of pieces of felt and hot glue to make a holder on the back of the pan for a sword. Use an xacto knife to cut slits in the side of the pan to run the ribbon through as shown below. Now you will be able to place the pan on the child’s back and tie the ribbon in the front. 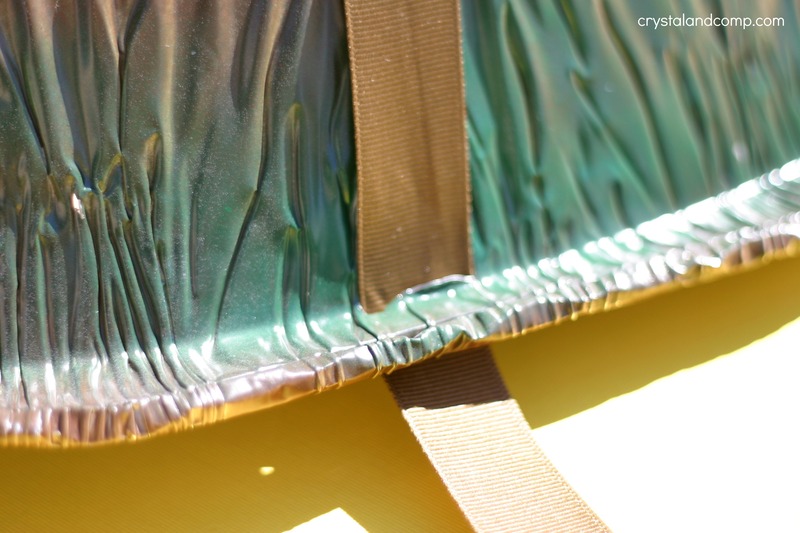 Use velcro and to connect the shirt and the frying pan just for extra hold. 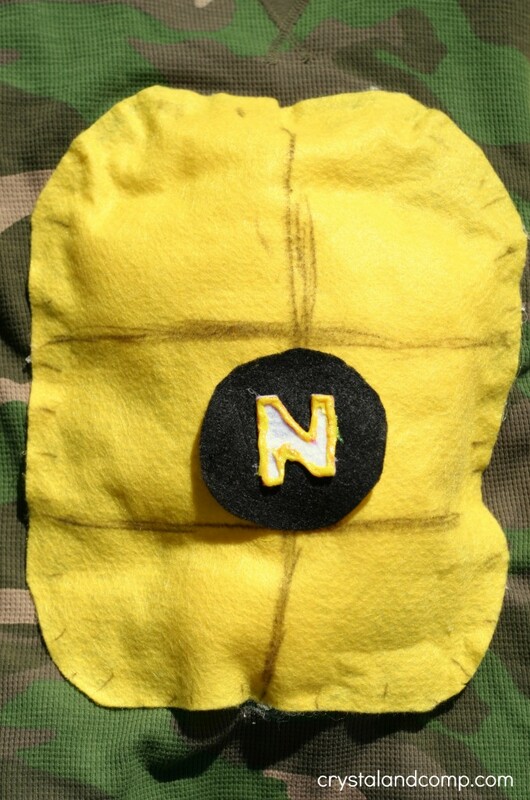 Cut out the piece of yellow felt in an rectangle-oval shape. 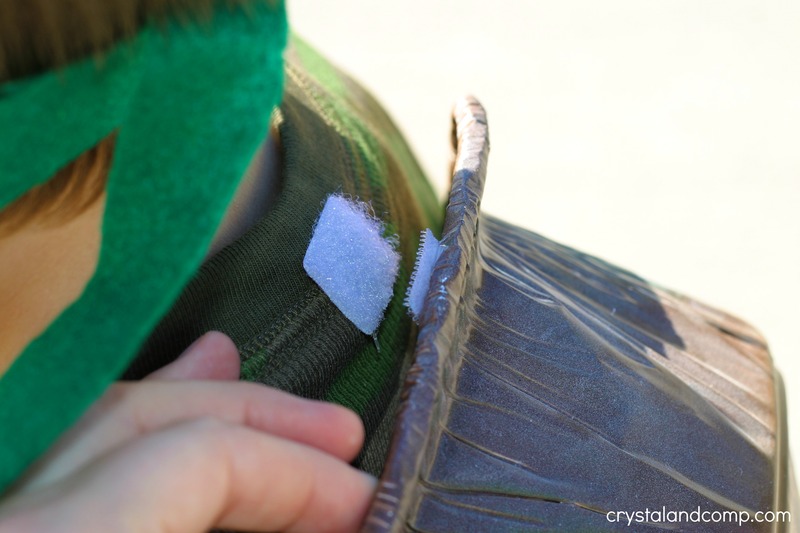 Place it on top of the shirt and start to hot glue the felt edges down into place on the shirt. This will serve as the belly of the turtle. Leave one small section open so you can fill this felt area up with Poli-Fil, which is like pillow stuffing. Then use the hot glue gun to seal the felt up. Use the marker to draw lines on the felt that resemble the belly of the turtle. You can see how we did this below. Next. cut a 2 inch circle out of black felt. Hot glue it onto the yellow felt. Use white felt to cut out the first initial of your child’s name. Hot glue the letter onto the black circle. Outline it with puffy paint if you want. This is totally optional. Spray paint it whatever color you want it. We did green. Whatever color you spray paint it, hot glue felt strips to the sides of it so you can give the mask the tied look for the costume. Gran your shreds of fabric, we cut up green fabric squares from the craft store, and cut them into strips. These can be tied on the pant legs of your child. 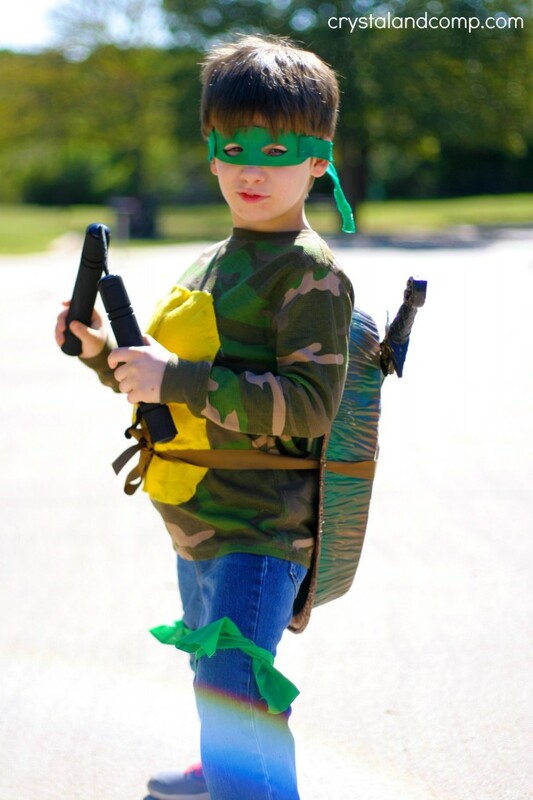 And now your little Teenage Mutant Ninja Turtle is ready to trick or treat! When was the last time you made a homemade Halloween costume? We had so much fun this week making costumes. I have more to share over the next few days! 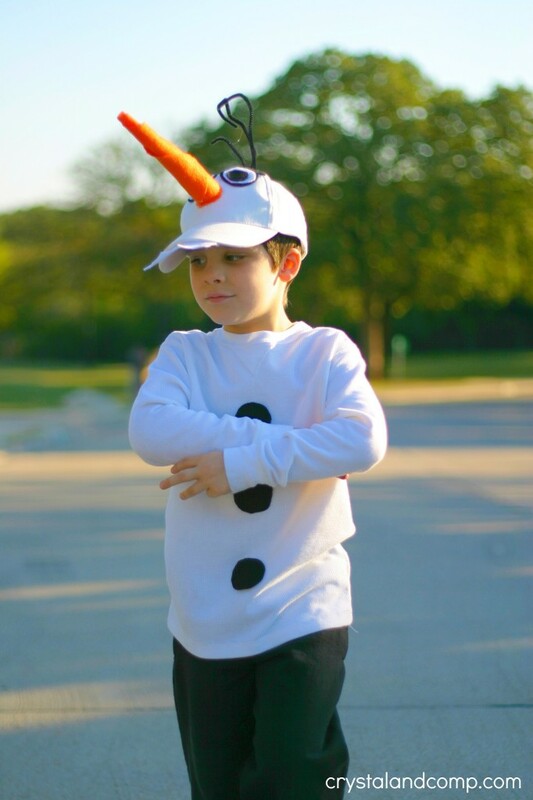 While you’re here, make sure you check out my Olaf costume that you can make for $10 and my Homemade Lego costume you can make for free! Check out our video below to see all 8 of the awesome costumes that were all created for $20 or less! Seriously I LOVE super hero costumes. One thing that I love about them is little boys love them too. Plus, you can make them look however you would like. 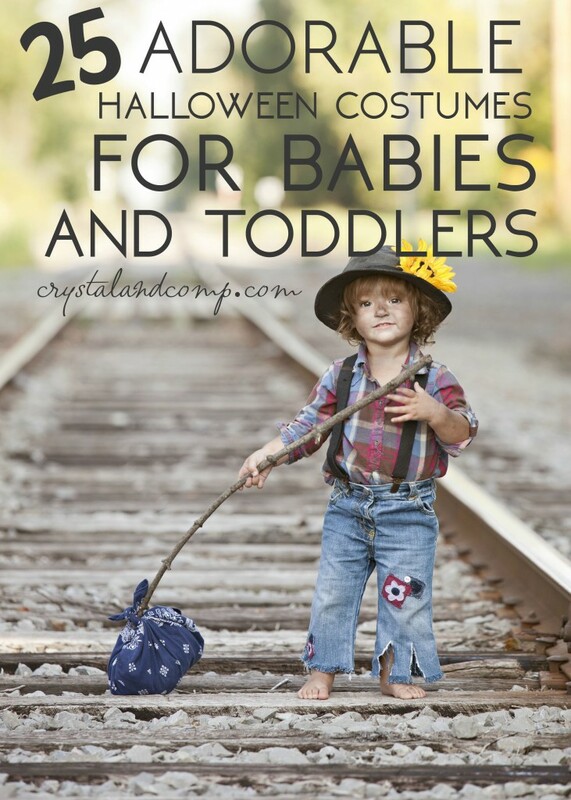 Let your little one help in making the costume and use their imagination. If your kiddos are anything like mine, they will wear their super hero costume for years to come…… even when they’re too big to fit into it. Super hero costumes are very popular right now. There are so many different super heroes which means there are a lot of different DIY Halloween costumes that you can put your twist on. I found this tutorial on how to make a rocket power jet pack which is perfect for all of those super hero lovers out there. 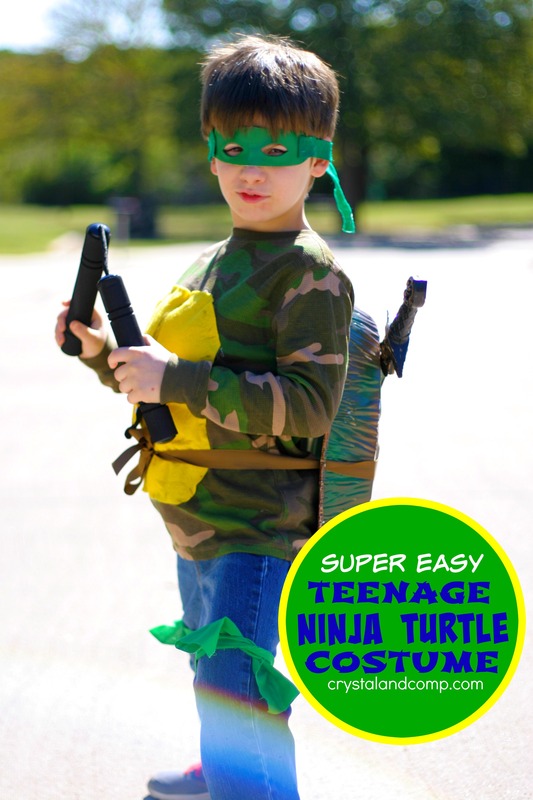 With this costume idea it’s the perfect little tool to help all those super heroes reach the stars. These jet packs are simple too. All you need is two, 2 litters of soda bottles (empty of course), two different colors of felt, a small piece of card board, old webbing, silver spray paint and there you have it. 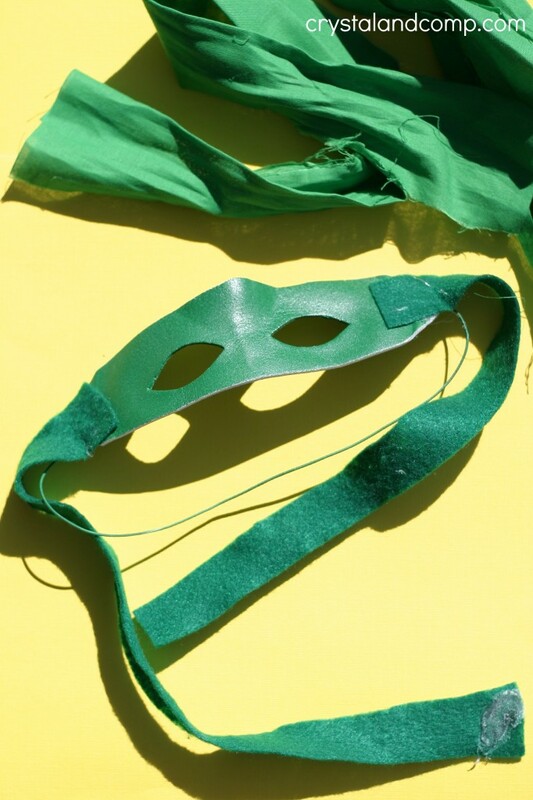 Put a super hero mask on your little one and let them have some fun trick-or-treating. You can find this tutorial over at Doodle Craft were she gives a step by step tutorial with photographs. This tutorial is easy as well as cheap and most of these items can be found in your garage I am sure. See what I mean? Isn’t this little super hero super cute? 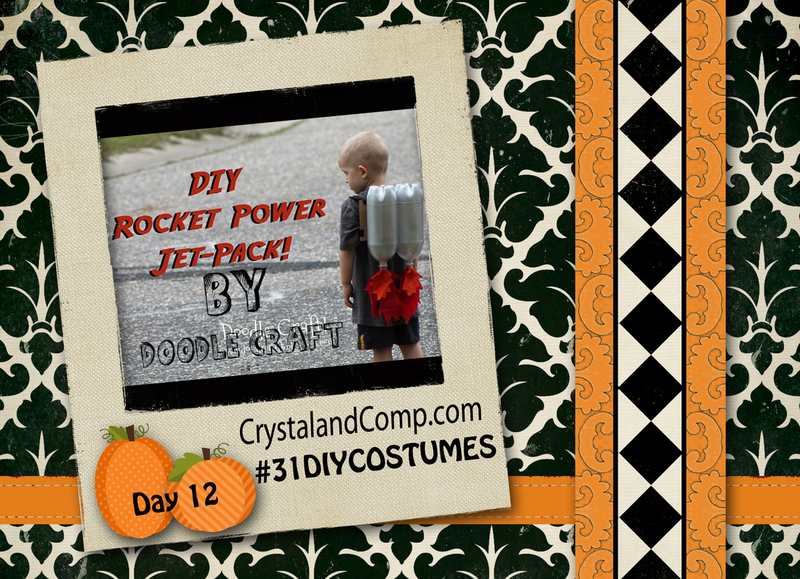 His sci-fi jet packs would make for the perfect finishing touch for your trick-or-treater. While you are here make sure you pin it to your Pinterest board so you can go back to it when you are ready to start building it. Happy Halloween!! Head over here to see the tutorial on this rocket power super hero costume.